Cheese and leek pie is one of those warming comfort foods that we all look forward to on cold winter days. There are many variations on this recipe and they all make ideal family meals – vegetarian or otherwise. Heat the oven to 210ºC or gas mark 7. Drop the six eggs into boiling salted water and cook for five minutes until hard. Drain and put to one side to cool. Place the potatoes into a pan of boiling salt water and cook until tender. Drain and mash with one tablespoon of the butter. Add the grated cheese. Place into an oven proof dish. Heat two tablespoons of the butter and fry the onion until slightly soft. Add the leeks and continue to cook until the leeks are soft but not broken. Season with the salt and pepper. Layer this mix on top of the mashed potato. Next take the cooled eggs, remove shells and slice evenly. Layer the eggs over the onion and leeks in the oven proof dish. Pour the carton of double cream over the eggs. Roll out the puff pastry until it is slightly larger than the oven proof dish. Lay the pastry over the oven proof dish and trim the edges of the pastry. Using two fingers seal the pastry to the edges of the dish. Pierce two holes in the middle of the pastry and brush over the egg wash.
Place in the middle of the oven for thirty minutes or until the pastry is golden brown and flaky. 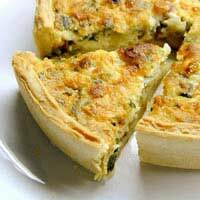 There are many variations on the Cheese and Leek pie. Some are made rather like individual Cornish pasties with diced cooked potato, leek and cheese in a plain pastry case. Other versions will not have a pastry case at all but resemble a potatoes pie with all the ingredients mixed into the mashed potato. When cooking with cheese you need the cheese to be of a strong flavour otherwise it will not be noticeable in the finished dish. These type of cheese dishes are ideal for using up leftover cheese from the fridge. Stilton and garlic flavoured cheese work just as well as the favoured cheddar cheese and bring a distinct flavour to a recipe. This recipe uses ready-made puff pastry which is easily purchased and is do easy to use it seems silly to try to make your own. It is also possible to purchase ready-made short crust pastry which work just as well but somehow puff pastry brings that extra wow factor to the recipe. Home-made suet pastry can also be used as it is very easy to purchase vegetarian versions of suet for cooking. This recipe does not freeze well and should be cooked and eaten as soon as possible.